This was a question that I found myself pondering as I wandered around UBC’s very first large-scale Pride function, which was organized by UTown UBC as a successor to last year’s much more chilled out Pride Picnic. When you attend Pride, it doesn’t matter whether you’re there as a part of the LGBTQIA2S+ community or in solidarity as an ally — it is all about acceptance and being yourself. That is, full heartedly, the impression that I got from Pride 2018 at UBC, which made me oh-so-happy. The event was colourful and tastefully decorated, full of smiles and glitter. The overall vibes being emitted from the large crowd were infectiously positive. 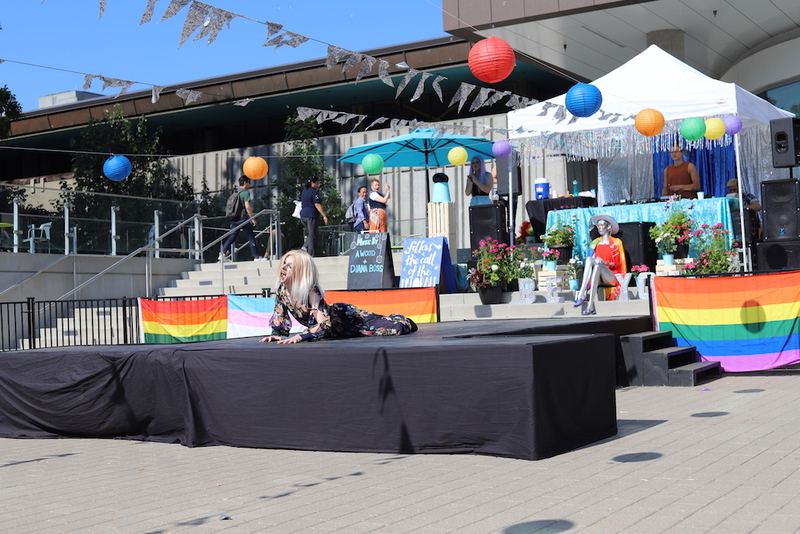 I was shocked to remind myself that this was UBC’s first large-scale Pride event, because they went all out. Everyone I spoke to was overwhelmingly excited about the day’s events — which included performances by local drag artists like slaylame and callistovoncatfish, slam poetry by UBC students, a pop-up queer library, a sparkle station that helped you glow to the gods and a public disco DJ’d by Diana Boss that got everyone grooving in celebration of freedom and love. And, if that didn’t already get me hyped, there were also food trucks like The Hungry Nomad and Plenty of Fish and a beer garden serving $5 drinks on-site. The festivities didn’t stop there. Later on in the evening, The Pit hosted Pride Pit Night — albeit opening a lot later than what was promised on the event page — which offered special cocktails and the usual assortment of drinks that we can expect from the venue. 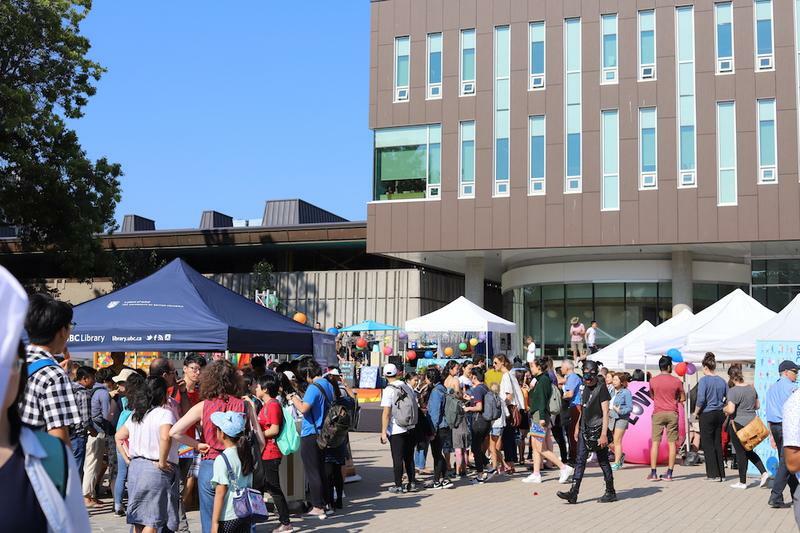 The space also featured booths manned by representatives from the AMS Sexual Assault Support Centre, the Wellness Centre, UBC Equity & Inclusion Office and UBC Sexual Violence and Prevention Centre. These booths offered free goodies and education as to what services UBC provides for those who may feel disenfranchised. The SVPC also provided an opportunity for attendees to write a small message of encouragement on a postcard, which would be given to someone who visits the SVPC office and is in need of support. 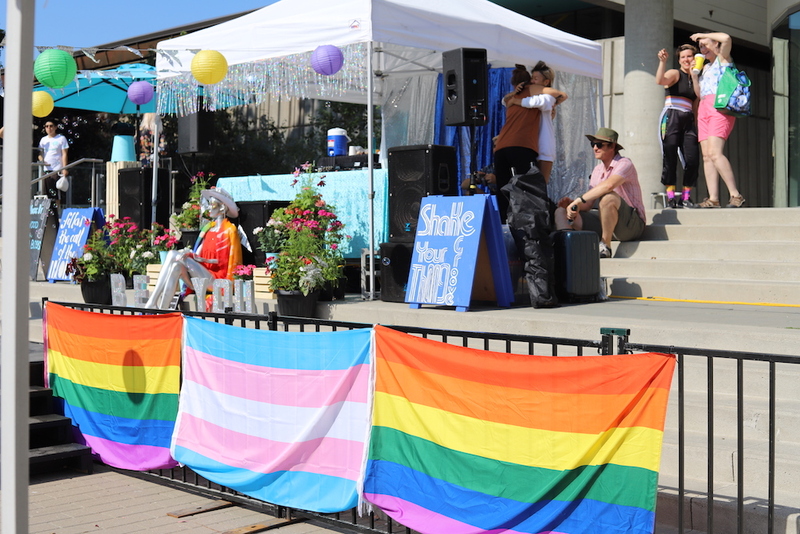 UBC Pride has created a fantastic precedent for future events to come and an opportunity for the UBC community to come together and celebrate love.